Oakland International Airport has joined the list of airports where passengers waiting for their flights can learn to save a life. In partnership with the American Heart Association, OAK airport now hosts two hands-only CPR training kiosks which offer travelers an easy, five-minute course in how to save help someone who is having a heart attack. Each kiosk has a touch screen with a short video that provides an overview of Hands-Only CPR, followed by a practice session and a 30-second test. With the help of a practice mannequin, or a rubber torso, the kiosk gives feedback about the depth and rate of compressions, as well as proper hand placement – which are the key factors that influence the effectiveness of CPR. Instructions are offered in English or Spanish and include closed captioning. At OAK, there’s one CPR training kiosk in Terminal 2, near Gate 27 and another in Terminal 1, near Gate 8. Not at OAK? There are 14 additional kiosks at airports across the United States, including at Cleveland Hopkins International Airport, Cincinnati/Northern Kentucky International Airport, Orlando International Airport, Dallas -Fort Worth International Airport, Indianapolis International Airport, Chicago’s O’Hare Airport and several others. As helpful airport amenities go, Hands-Only CPR training kiosks can be lifesavers. Orlando International Airport: entrance to the Main Food Court. The machines offer a five-minute course in the Hands-Only CPR technique and can really help save lives: more than 350,000 cardiac arrests occur outside the hospital each year and about 20 percent occur in public places such as airports. Performing CPR right away can double or triple a victim’s chance of surviving. Each kiosk has a touch screen with a short video that provides an overview of Hands-Only CPR, followed by a practice session on a rubber torso and a 30-second test. The kiosk gives feedback on hand placement and the depth and rate of compresssions. Not sure this works? In 2016 Matt Lickebrock spent 5 minutes learning the CPR technique on a machine at DFW International Airport in 2015 and few days later learned his new skill to save the life of his buddy, Sean Ferguson after he was struck by lightning in a parking lot at the University of Dayton. That’s Ferguson in the pic below learning the technique too. Airlines are reporting profits and being urged to join humanitarian efforts to help plug a $15 billion funding hole in global disaster relief. The call comes on the heels of a United Nations report that found while at least $40 billion in annual humanitarian aid is needed annually to help victims of natural disasters and armed conflicts worldwide, today the world spends only $25 billion a year on securing and getting food, water, shelter, medical supplies, support teams and other emergency resources to people in need. That’s twelve times the amount spent 15 years ago, the report notes. But with so many in need now, new disasters cropping up all the time and the high costs associated with rushing humanitarian relief to where it will do the most good, creative solutions are needed. And that’s where alliances between airlines, aircraft manufactures and a variety of non-governmental organizations come in. Through its foundation, aircraft manufacturer Airbus has been filling some otherwise empty, new aircraft being delivered to customers from its factories in Hamburg, Germany and Toulouse, France with humanitarian relief supplies destined for disaster-hit regions and communities in need. Since 2008, airlines such as Emirates, JetBlue, South African Airways, Thai Airways, Vietnam Airlines and a handful of others have worked with Airbus on at least 30 delivery flights that have brought more than 250 tons of humanitarian relief to areas of Nepal, Columbia, Thailand, Africa and Haiti. On more than 15 occasions, Airbus has also used its test planes to deliver additional supplies quickly in the aftermath of disasters. For example, a test aircraft loaded with 50 humanitarian staff and about 22 tons of food and medical aid flew to Nepal in 2015 after the devastating earthquake. And a Nepal Airlines aircraft delivery flight was used to transport more than five ton of relief goods and medical equipment to Kathmandu. 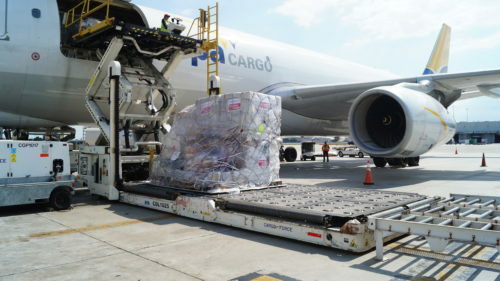 Through its Humanitarian Delivery Flight program, the Boeing Company also works with nonprofit and NGOs to load everything from medical supplies and clothing to educational materials into the empty cargo space of new airplanes for transport and delivery to areas of need. Since 1992, Boeing’s program has made 180 humanitarian delivery flights, working with more than 50 airline customers to deliver more than 1.4 million pounds of supplies. At least 26 of those humanitarian delivery flights have been on Ethiopian Airlines, which has also helped its neighbor, Somalia, by bringing back needed supplies. “These flights have helped transform lives with their precious cargo,” said Bill McSherry, vice president of Government Operations at Boeing Commercial Airplanes. Delivery flights don’t always get relief supplies exactly where they need to go, so Boeing often teams up with Airlink, a Washington, D.C. nonprofit disaster relief organization that works with more than 35 airlines and more than 60 NGOs, to transport supplies and relief workers. “We focus a lot on disaster response, but also on what you might call slow-burn events, such as an education program in Africa that is teaching children not to play with land mines and other remnants of war,” said Airlink Executive Director Steven Smith. Smith notes that since more than 60 percent of humanitarian funding goes to supply chain costs, the transportation and coordination services airlines and Airlink provide can help NGOs stretch budgets and be more effective. During the recent Ebola crisis in West Africa, for example, Airlink sent healthcare workers and 100 shipments of aid for 37 different NGOs using 11 airlines. And more recently, Airlink used donated miles and funds from Air Canada, Alaska Airlines and United Airlines to send 19 military veterans from Team Rubicon USA and Team Rubicon Canada to Fort McMurray in Alberta, Canada to help out residents returning home after devastating wildfires destroyed more than 2,400 homes.